The mysterious madwoman had come to warn her against Sir Jeffrey Wilstoun, master of Holyoak – the arrogantly handsome young man who had brought her to the big, gloomy house to tutor his two strangely precocious little sisters. Written by Laurence M. Janifer. First Signet printing August 1966. 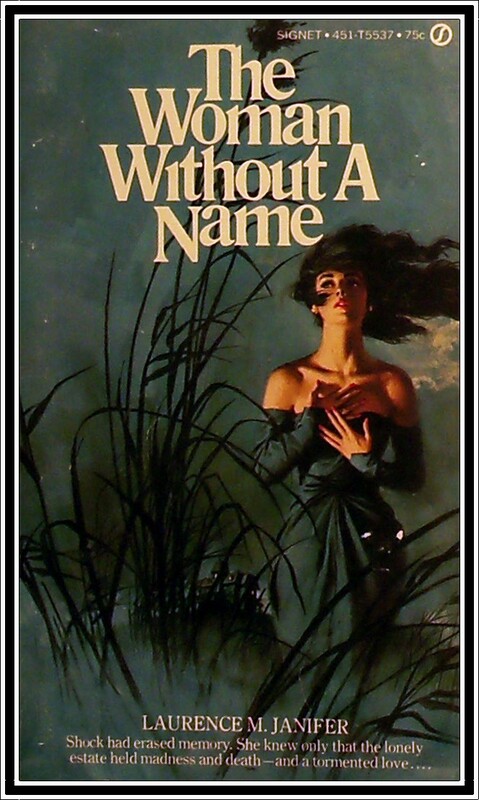 Ho hum, I really wanted to love this one (gorgeous cover and all) but if I’m honest, Women Without a Name was as fatally flawed as any tragic gothic anti-hero, and not half as much fun to curl up in bed with. Where to begin? There’s a governess (Penelope) and some children and an isolated house somewhere in the middle of God knows where. So far so good. Then our heroine stumbles upon the Big Scary Mystery – someone is in the attic! But not the mad woman, no, she’s wandering about in the woods, wearing a multicoloured shawl (therefore demonstrating she is hopelessly insane) mumbling about how evil it all is. 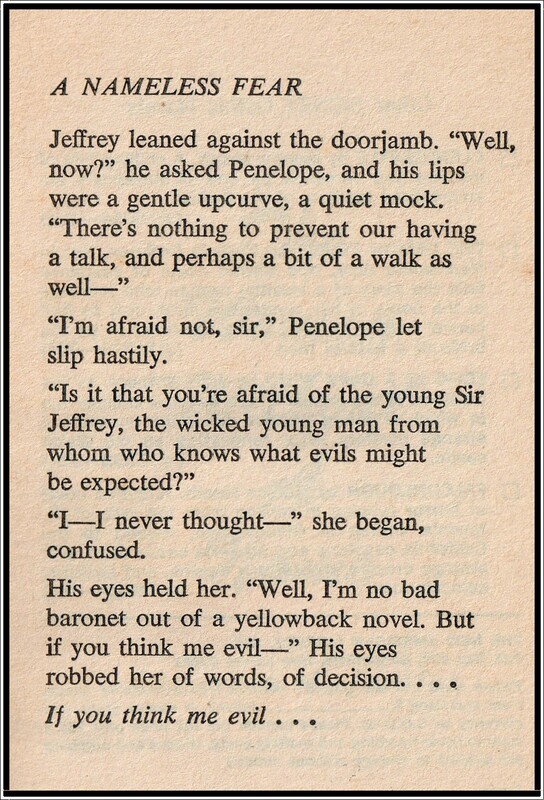 Enter our Lord of the Manor, Jeffrey, who takes a mere 50 pages to fall helplessly in love and propose to Penelope. Unfortunately for us, it takes her twice as long to actually go look in the attic to find out what all the fuss is about. Turns out there’s an evil twin (and I usually LOVE evil twins) which somehow proves our hero is not evil and therefore marriageable material. Penelope faints, then wakes up, then decides she wants to get married too. And so we all live happily ever after. Sigh. I googled the title of this book half expecting to find not very much at all – but it transpires Laurence M. Janifer is a well known SF writer with a career spanning over 50 years. (More information on the author and some reviews can be found HERE.) Hopefully The Woman Without a Name is Laurence M. Janifer’s only gothic. To be fair the writing is ok, it’s just that he took every cliché he could think of before jumbling them all together without really giving much thought to the development or pacing of the story. At 26,000 words it’s an easy afternoon’s reading – but not necessarily an enjoyable one. Two out of five stars. *STOP PRESS* For some extra information, check out the comments sent in by Ruben below. 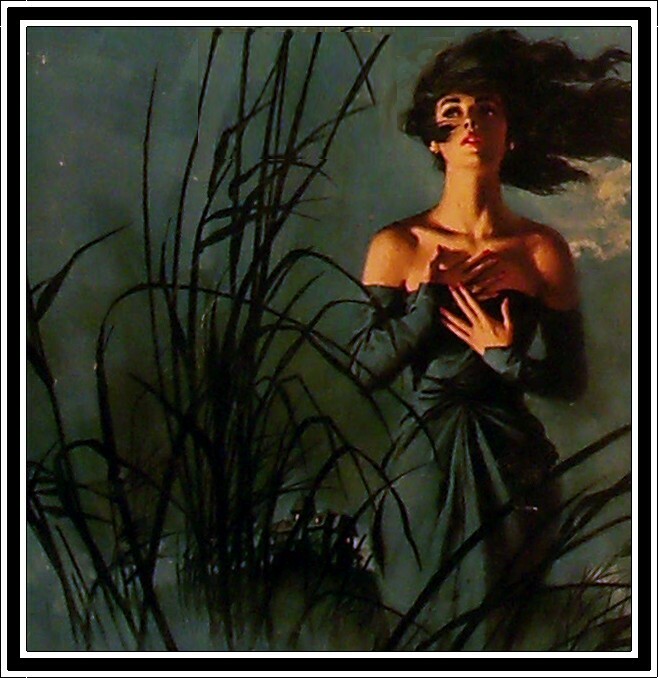 The artwork is by George Ziel. Ruben has also posted his collection of paperback art on the web, which can be drooled over HERE. Ruben, thank you for the info and you have some gorgeous artwork (almost!) worth selling my soul for!